This project in Richmond takes advantage of the fact that the home is on acreage with a total space of 18′ x 41′ under cover and some additional patio space outside the cover. The stamped overlay is a Roman Slate pattern with a Texas Star in the walkway to the gate. The homeowner has a large extended family and their home was used most often for family events due to their space available. This conceptual drawing was created during the design process to help the homeowner visualize their use of space. The project includes a gas-log fireplace with a stone veneer that can be lit by remote control. It includes an extended hearth for extra seating. 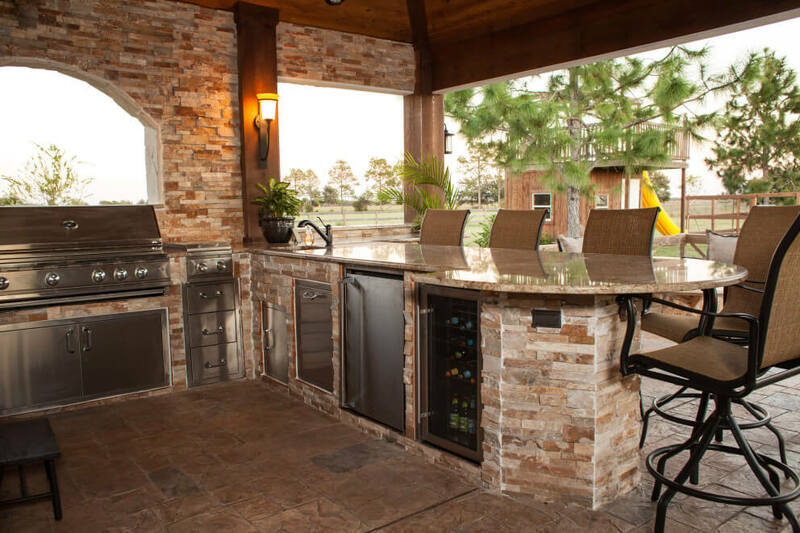 A sizeable outdoor kitchen was built with extended countertops for more built-in seating and entertaining in mind. The kitchen and columns used a ledge panel stone fascia that blends well with the veneer stone on the fireplace. The pine ceiling and cedar trim are both stained with a Cabot Heartwood stain, providing a contrasting darker color on the trim. Electrical included recessed can lights on a dimmer switch; under-counter lights on the kitchen; carriage lights on the columns; coax for TV and speakers. Because it is a new home with no mature landscaping or shade, the homeowner desired an outdoor living space designed for year-round entertainment in the moderate climate of Houston with plentiful seating and entertaining areas. The homeowner also wished to vary from the all-brick facade of the home and achieve a “Texas Hill Country” look incorporating stone and cedar finishes to complement the brick. In addition to the fireplace, we built a wood-burning firepit for starry nights and s’mores.